Kathy Fox is the owner of Bella Venetian Beads, and therefore is the perfect person to write the book The Venetian Glass Bead for Kalmbach Publishing. She has made many trips to visit and buy from bead makers in Venice and on Murano, and you can feel her passion in this book as she shares the history and tradition behind this art form. 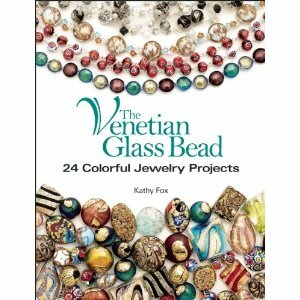 Besides being a project book, Kathy's book covers the history of Venice and how glass making fit in, and she pays special attention to the unique qualities of Venetian glass beads. As you look through the projects, you are introduced to many different styles of Venetian beads by name. This includes information on how they are formed and tips for spotting good ones and knowing when you're holding real ones! Yes, unfortunately, even the Italian market is full of fakes and imports, but you won't have to worry once you familiarize yourself with the real thing. Most of the projects are not particularly challenging; instead, they are designed to showcase the beauty of these special beads. Therefore, it's a great book for beginners who want some really nice basic design ideas. Some of Kathy's designs make lavish use of Venetian beads, but she also includes plenty for the budget-conscious beader. One particularly cool (and more challenging) project is a bracelet that features Viking knit. Now that is a technique you don't find in every beading book! Hello Cyndi, this sounds like a nice book, I have just been lucky enough to buy some gorgeous Venetian beads. The history of places is always fascinating too.